Having just bought the new Razer Lycosa keyboard, I unfortunately ran into the same problems as many others did. For me the shift and backspace-keys only worked occasionally and the backlight was considerably darker in the center of the keyboard. Placing a coin on the Razer-mediakey seemed to help, but now I was unable to use any other media buttons, or the Windows-key, and one of the reasons I bought this particular keyboard (besides its awesome feeling :D) were the mediakeys. With the store having closed and me not wanting to return it, I read from someone who claimed that he just opened his keyboard und tinkered a bit with the plugs inside, which fixed his Lycosa. So I gave it a try – and it worked! I’ve taken some photos while working and will try to recount every step I made, so you can fix your keyboard too. 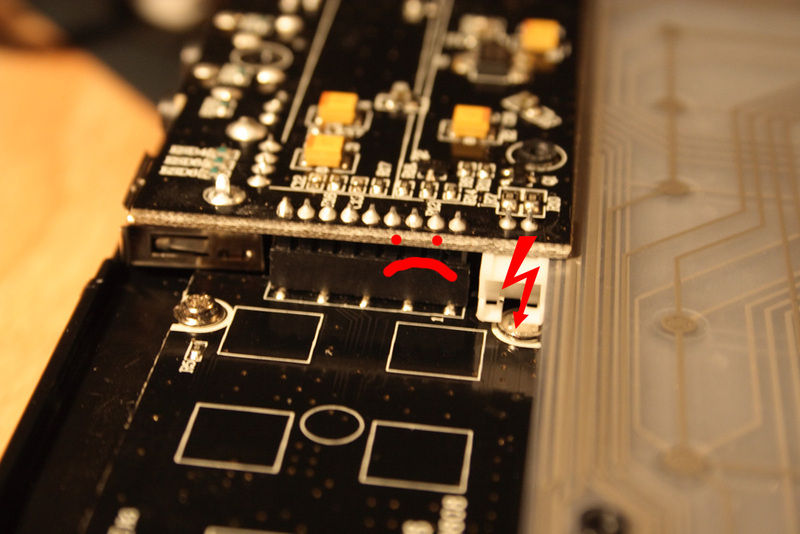 The actual problem seems to be a screw that prevents the touchpad-plug to fully connect to the main chip board, which screws up some major functions like sending input „signals“ longer than a few milliseconds. Disclaimer: This fix does not guarantee anything, your keyboard might return to the bugged state after a few days. The cause of all the malfunctions is a plug inside the keyboard that might lose it’s connection, because of how the whole Lycosa is built. 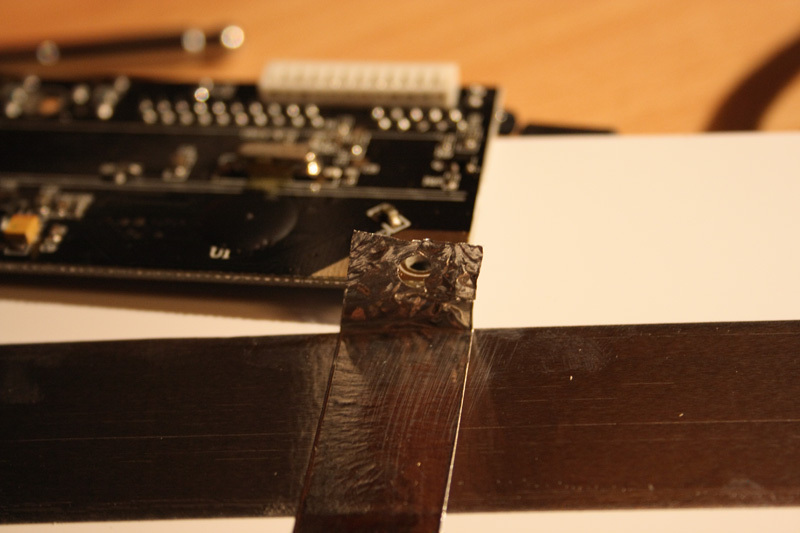 You can come up with your own ideas, for example solder every pin to the main circuit-board, or try my solution. Fortunately, you don’t have to break any warranty seals / stickers when opening the case. So you could give it a try and if it still does not work, you can return it to the store. 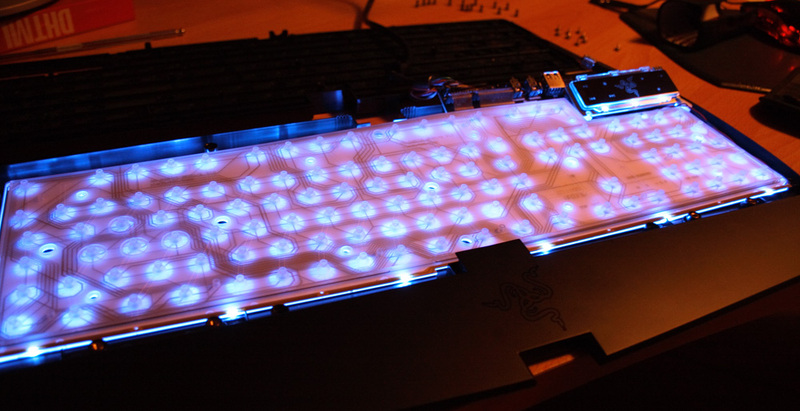 Unplug your keyboard, turn it around and remove all 19 screws. Seems like Razer build their keyboards to resist even a nuclear strike. 😉 Once you have removed all the marked screws, pull off the palm rest and put it aside. 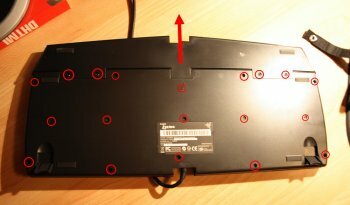 Carefully remove the backplate of your keyboard and put it aside. Now unscrew and remove the next 9 screws which are marked in the photo. 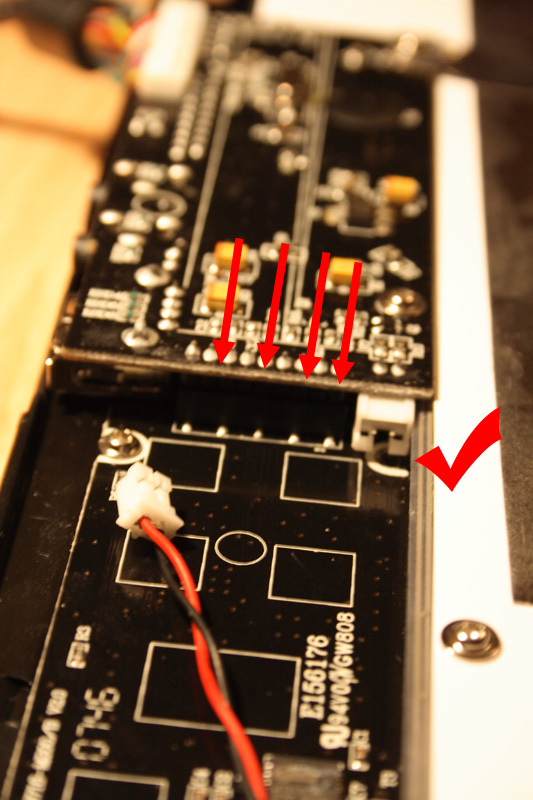 After that, unplug the LED power connector (red arrow). Try not to mix those second screws with the ones from step 1, as they are different. 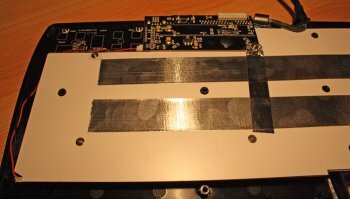 Peel away the silvery tape from the main circuit board. Don’t worry if it rips, as long as you can still connect it to the board. After that, remove the white backpane. 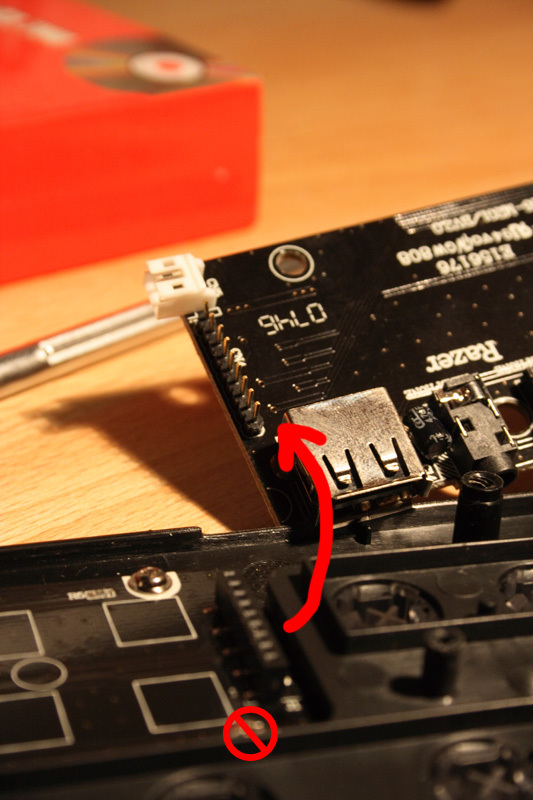 Now we can take a look at the mischievous screw… It blocks the whole circuit board from being pushed down and the touchpad plug from connecting fully. The screw itself is just fine, but unfortunately the plug at the left can lose the connection because of it! Here comes the critical part: carefully unplug the upper circuit board and remove the evil screw of doom. As it’s one of 4 supporting screws of a touchpad (and not a hammerpad) it won’t be missed. 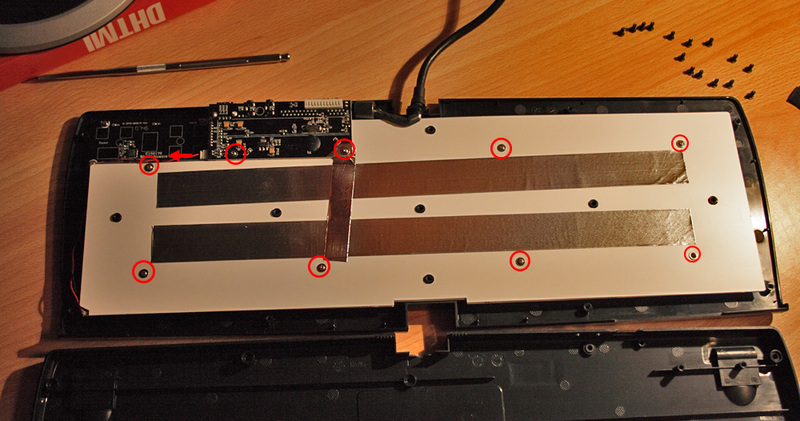 Now put the white backpane back onto the keyboard and tightly connect the upper circuit board to the touchpad. At that point, the key problems should be gone. To make sure that everything works, plug in your keyboard and power up your computer. Make sure that everything now works like it should, before you move on to the next step. If it still bugs, you didn’t connect it thoroughly. If your back-lit keys were too dark around the center of the keyboard, turn around the whole inside and check the board for any dark spots. If you don’t find any (like in the photo), the darker keys in the center are probably a result of too tight screws. Put everything together. Don’t forget the silver tape, you have to reconnect it to the edge of the circuit board. Before you close the chassis, once again make sure everything works fine. After that, add the screws in groups of 3 or 4, constantly rechecking the functionality of your keyboard. I had to screw them in twice, because after the first time they backlight became darker if I closed the chassis. If you did everything right, your keyboard should be fully operational, all the keys working. You should even be able to press Ctrl + V with capslock on. 😉 I hope my little guide helped you fix this otherwise great keyboard. If you have any questions, use the comment function under this post! Wonderful, fixed the problem of the Razer lycosa not responding to pressing certain buttons. Just forgot to remove one of the screws on the back (under a little white sticker) and then it was pretty easy. looks pretty sweet without the handrest – so much more desk room! Yeah I decided to take the plunge and buy one. Well guess what it don’t work right. This the second keyboard from a totally different supplier. Both MT10 serials. First one arrives scratched and the keyboard works but the touchpad is totally screwed. Second one arrives and looks fine, touchpad works fine but letters keep stopping working. Esp the „c“ „t“ and „return“ keys. Oh and sometimes the skip track touchpad button will activate too. Took it apart and removed the screw and still having problems. I read somewhere it could be usb current. Apparently on another site a guy used a multimeter and saw it draws more than usb spec so using a overspec usb hub might work but then i also heard running through a hub causes problems lol. Ive messaged razer with my fault and hopefully il hear something back soon. I have a real love hate affair with razor atm. i find myself searching for other illuminated keyboards that look just as cool and are seemingly as functional. None compare, its just so heartbreaking to look at this thing and know its useless. Wish I was good enough to write my own drivers. Maybe if someone is reading this and has the knowledge they could start the ball rolling. The keyboard must be generating outputs and the driver must be responding so perhaps we can watch for the fault happening and fix it somehow. I dunno. Damn just so annoying. I dare not play a game online if keys stop responding il get creamed. This worked great, I have the MT1 S/N too. my keys didn’t come back right away but I went into the razer config and played with it. Now i have a fully functional keyboard. Thanks for the post. Thank you so much m8! Works like a Charm! MT09 serial keyboard still with this problem, I can’t believe nearly 4 years on they still haven’t fixed it properly. I’m going to write a nasty letter. Cheers heaps for the post. Thanks, for this great guide. Thanks for this man! did it few hours ago and still no problems… I was really hopeless. Very iportant!!! This fix worked but only for one week. I dissasembled the keyboard again and got rid of the second screw above the bad one. Now the left side of the touchpad is 1mm down compared to the right but now it seems to work, i also bended the pins for a pressured contact. My numberpad 7 works again! I have just bought a brand new Lycosa, serial number MT11 , and it has all the same problems. Keys get stuck (not mechanical), like pressing the F key will write ‚GGGGGGGGGGGGGGGGGGGGGG…“ endlessly, in particular if i have used the touchpad just before to light the keys, or used the backspace key. Other times, the keyboard just get nuts and open all kind of windows and prompts when i try to type anytihing. Rebooting and pluging another cheap USB keyboard is the only way to get my computer back, when that happens. I re-installed the 3.0.2 driver many times, but did not fixed the problem. I tried it on my other computer. On this one, i get non stop Windows Media pop up windows if i happen to use the touch pad only once.Only fix is to reboot and use another keyboard. I did not test any further, and put back the keyboard in its box. I would have no problem to get another Lycosa from store, but i think i will change brand. Any idea for a macro-programmable keyboard that has the same width as regular usb keyboard? Well, I switched to a Logitech G15 and am still using it today. 🙂 But as someone else already pointed out, you can probably send in your faulty keyboard and get a new one that should work. Well, I cannot trut anymore this Razer company. They sure know by now what is the exact proportion of these Lycosa that are dysfunctionnal, and they continue to produce them without fixing the issue. If, let us say, there is 1 in 1000 units that is not working properly, that is already way too much. Look on Tom’s harware website, or else, and you find tons of cases like those written here. It is clearly not acceptable. And, many casees where the replacing Kycosa is as dysfunctionnal as the previous one. Noe way, i do not want another Lycosa or any other Razer keyboard, and wll not buy anything from them anymore. gret fix, till now everithing works great. you saved my keyboard. Awesome! Just awesome! Thank you very much for this! My board was total chaos, it lived its own life for a while, stuff like when I pressed ‚W‘ it wrote the whole alphabet and opening windows and programs. I was about to lit it on fire and throw it out the window, but you saved it! Thanks! I had an MT08 lycosa back around 2008 that had the touch pad issue and need to be replugged, then the touchpad permately became unresponive. Removing the screw on this MT08 model wasnt effective but it might be the pins that are the issue making contact. I bought a new lycosa MT12 version and the touch pad works but it will glitch out causing the leds to change modes by itsef and then cause the keyboard to freeze, replugging it fixes it till it decides to glitch out. I bough another one just for comparisions reasons to ill see if this other one still has issues lol. This is an update to my previous response. I recieved my other MT12 Lycosa which works perfectly out of the box compared to my other MT12 Lycosa which glitches out every hour or so. 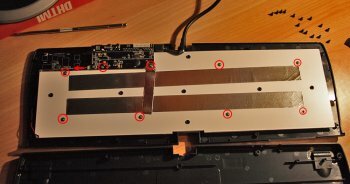 I dedcided to open up the problematic MT12 Lycosa and the touch pad was literlty lifted of the stands making bad contact, i smply pushed the touch pad down and it works, i didnt remove the scew for testing reasons but removing the screw anyway is recommended. Oh ya lettering printed on all the keys on one of the Lycosas was slightly of centered, major quality control issues with Razer, the design isnt the problem its legit the quality control lol. I have an MT09 lycosa that was sitting in a box collecting dust for the last two years. It had repeating key problems and contributed to a loss at a gaming competition. For whatever reason, i didn’t break it in half. Anyway, I dug it out and decided to look around for fixes which lead me to this site. As i was disassembling the keyboard, i noticed nearly every screw was overly tightened. The LED panel thing was actually bent from screws near the touch-media controls. So, i took the opportunity to clean everything inside the keyboard using paper towls and Windex, including both sides of each of the ‚mylar‘ sheets. there was like 4 of the plasticy things and i cleaned both sides; I noticed some burns around the WASD LEDs, but they still work just fine. Also I noticed some burned looking circuits leading away from the keys that repeated; the ‚C‘ key being the main culprit. I cleaned some of that away with Windex, too. When I put it all back together, I was extremely careful tightening all the screws, including the ’screw of doom‘. I am not of the opinion that removing that particular screw helps so much as reseating EVERY screw does. As i was rescrewing everything, i would lightly press in the keys behind the screw so i could feel the pressure if it was too tight. 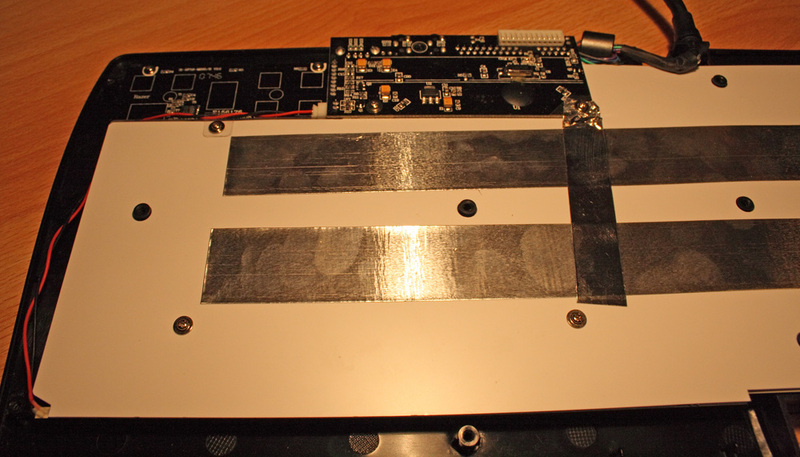 I did this for both the LED board AND the outer shell screws. Since I’ve done this, I have yet to have any repeating keys. The keyboard has been in use for 24 hours and with luck, the problem may have gone away entirely for me. In the past, I remember I also had the problem of keys stop responding entirely until the whole keyboard stopped working until i replugged the USB connector into the port. As I said, so far I’ve not had any problems and i spent about an hour retyping ‚the quick brown fox jumps over the lazy dog‘ over and over to try and trigger the problems. Looks like this may have fixed the keyboard, so far. Thanks for the heads-up. It’d be a great keyboard, if not for Razer’s shoddy QA team. Cheers. Yes it is work wiyj my Lycosa.Easy job,it is not necessary to peel the silver tape. Hey bros, I have a Razer Lycosa Mirror, and for aproximately 4 months, I have been facing issues with this keyboard. My F key would not work, and basically I can’t use it, Ive tried banging on it, pluging it in and out, and bascially, nothing works. Until I read this guide, and my god, it works, like instantly. Thank you so much. Do keep track of your screws, Some have a screw well that requires either you to flip it to get it out or have a magnetic scredriver, get it out, I lost one. And still looking for it. Cheers again bro, thanks! Typing this via my newly fixed Lycosa. Hats off to you sir, brilliant guide! I had some of my numpad „2“ key not working for a couple of years. And it got worse with several of them not responding anymore. Thanks to your tutorial, i’ve unmounted the keyboard, and made sure the keys ramp overlapped the frame, so you can listen them relocating and bounce back onto the chassis. Tighten the screws firmly, except for the Panel. Thank you for your great help !